This has been floundering about for a couple of years. Mostly cuz there is only one second worth of decent video. I made the best of that one second tho'! Great Teacher, Poor Results from D Skidz on Vimeo. From the mass-media! 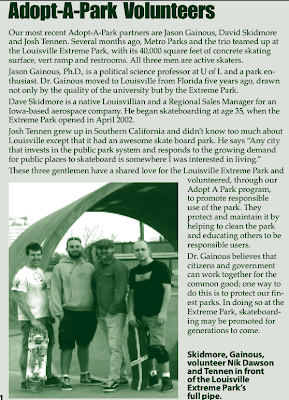 The widely distributed, internationally acclaimed 'Louisville Parks and Recreation Guide' featured a massive op-ed on the heroics, valor and natural good looks of some Concretin volunteers. It is sad that everyone can't be us. A long time a go on vacation I hit the now-defunct X-Park in Pensacola, FL. with Brother Steve. We snapped some shots here and there in the park. Last year my kids came up with an awesome family game for my birthday using one of said photos. So, while the photo is not a skateboarding photo, it is very slightly skate related. Yea, let's do that. Come wreak havoc with the Cretins, a couple of Kooks, and celebrate the northern return of Team Geritol and all our friends. Sunday, January 30th, at Ollie's Skatepark in Florence, KY. Doors open at 11:00am. Be there, or be jealous. Your choice.